The Baltic Sea Diet Pyramid – Finnish Heart Association, Finnish Diabetes Association and University of Eastern Finland. If sourdough rye, pickled herring, Icelandic yogurt with blueberries, or sugar snap peas and garlic potatoes sound good to you, you may find the Nordic diet a satisfying choice. Similar to the Mediterranean diet but focused on a Scandinavian lifestyle this diet has similar health advantages. Last month I wrote about the Mediterranean diet having learned about it by taking the free online course, Understanding Different Diets: Mediterranean, Baltic Sea, and Okinawa. All three diets relate to both the geography and the culture of a region in the world where people are known for their hearty longevity. Today let’s look at the Nordic diet. 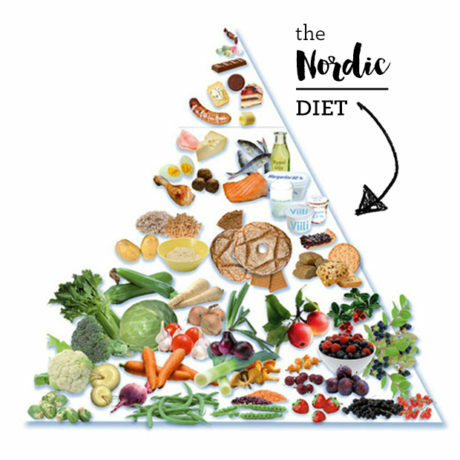 The Nordic, or Baltic Sea diet was developed in 2004 by Danish nutritionists, scientists and chefs in an effort to decrease growing obesity rates, address unsustainable farming practices, and reduce food waste in Nordic countries. Similar to the Mediterranean diet it is primarily plant based, low in saturated fat and high in antioxidants and fiber. Both diets are associated with lower incidence of chronic diseases, such as cardiovascular disease and type 2 diabetes. At the base of the Nordic diet food pyramid are antioxidant-rich berries, apples, and cherries, nutrient rich root vegetables, cabbage, Brussels sprouts, peas, spinach, mushrooms, garlic and onions. Whole grains including barley, oats and rye as well as nuts and legumes occupy the next tier of the pyramid followed by fatty fish like salmon, herring and mackerel (good sources of heart healthy omega-3 fatty acids) and the occasional use of venison or other game meats. The Nordic diet uses rapeseed (canola) oil. Similar to the olive oil featured in the Mediterranean diet, canola oil is high in heart-healthy monounsaturated fats. Up at the top of the pyramid, in the, not good for you use sparingly section are the sweets and processed foods. As a cultural component, the Danish concept of Hyggie invites you to enjoy sharing food in friendly, relaxed comfort. Favoring what is local and in season provides both the best taste and nutrition besides lowering the carbon footprint of food preparation. For a healthy inexpensive lunch in a friendly, relaxed “Hyggie” atmosphere join us at the Mullis Center on Mondays and Thursdays at 11:45 am. Cost is $7 for persons under 60 years old; suggested donation for seniors is $5. Check the Mullis Center Facebook Page for what is on the menu.